Assessments must be based on good analysis, timeliness and transparency and be proportionate to the needs of the child and their family. Each child who has been referred into local authority children's social care should have an individual assessment to identify their needs and to understand the impact of any parental behaviour on them as an individual. Local authorities have to give due regard to a child's age and understanding when determining what (if any) services to provide under Section 17 of the Children Act 1989, and before making decisions about action to be taken to protect individual children under Section 47 of the Children Act 1989. In April 2019, this chapter was revised to reflect updated guidance on Assessment in Working Together to Safeguard Children. A Child in Need is defined under the Children Act 1989 as a child who is unlikely to achieve or maintain a satisfactory level of health or development, or their health and development will be significantly impaired, without the provision of services; or a child who is disabled. In these cases, assessments by a social worker are carried out under Section 17 of the Children Act 1989. Children in Need may be assessed under Section 17 of the Children Act 1989, in relation to their Special Educational Needs, disabilities, or as a carer, or because they have committed a crime. The process for assessment should also be used for children whose parents are in prison and for unaccompanied migrant children and child victims of modern slavery. When assessing Children in Need and providing services, specialist assessments may be required and, where possible, should be coordinated so that the child and family experience a coherent process and a single plan of action. The need to assess can also include pre-birth situations when a mother's own circumstances would give cause for concern that the pre-birth, and then born, child would come within the definition of being a 'Child in Need'. (See Section 11.1, Pre-birth 'Good Practice Steps'). Concerns about maltreatment may be the reason for a Referral to local authority children's social care or concerns may arise during the course of providing services to the child and family. In these circumstances, local authority children's social care must initiate enquiries to find out what is happening to the child and whether protective action is required. Local authorities, with the help of other organisations as appropriate, also have a duty to make enquiries under Section 47 of the Children Act 1989 if they have reasonable cause to suspect that a child is suffering, or is likely to suffer, Significant Harm, to enable them to decide whether they should take any action to safeguard and promote the child's welfare. Such enquiries, supported by other organisations and agencies as appropriate, should be initiated where there are concerns about all forms of abuse and neglect. This includes female genital mutilation and other honour-based violence, and extra-familial threats including radicalisation and sexual or criminal exploitation. Some Children in Need may require accommodation because there is no one who has Parental Responsibility for them, or because they are alone or abandoned. Under Section 20 of the Children Act 1989, the local authority has a duty to accommodate such Children in Need in their area. Following an application under Section 31A, where a child is the subject of a Care Order, the local authority, as a corporate parent, must assess the child's needs and draw up a Care Plan which sets out the services which will be provided to meet the child's identified needs. Every assessment must be informed by the views of the child as well as the family, and a child's wishes and feelings must be sought regarding the provision of services to be delivered. The assessment should be led by a qualified and experienced social worker regularly supervised by a social work manager. Principal social workers should support social workers, the local authority and partners to develop their assessment practice and decision making skills, and the practice methodology that underpins this. The date of the commencement of the assessment will be recorded in the electronic database. Consult with and consider contributions from all relevant agencies, including agencies covering previous addresses in the UK and abroad. If it is determined that a child should not be seen as part of the assessment, this should be recorded by the manager with reasons. Before a Referral is discussed with other agencies, the parent's consent should usually be sought, unless to do so may place the child at risk of Significant Harm, in which case the manager should authorise the discussion of the Referral with other agencies without parental knowledge or consent. The authorisation should be recorded with reasons. If during the course of the assessment, it is discovered that a school age child is not attending an educational establishment, the social worker should contact the local education service to establish a reason for this. In planning the assessment and in providing the parent and child with feedback, the social worker will need to consider and address any communication issues, for example language or impairment. Where a child or parent speaks a language other than that spoken by the social worker, such as those who are unaccompanied children, and those children who are victims of modern slavery and/or trafficking, an interpreter should be provided. Any decision not to use an interpreter in such circumstances must be approved by the Team Manager and recorded. Where a child or parent with disabilities has communication difficulties it may be necessary to use alternatives to speech. In communicating with a child with such an impairment, it may be particularly useful to involve a person who knows the child well and is familiar with the child's communication methods. However, caution should be given in using family members to facilitate communication. Where the child has had a communication assessment, its conclusions and recommendations should be observed. Children should to be seen and listened to and included throughout the assessment process. Their ways of communicating should be understood in the context of their family and community as well as their behaviour and developmental stage. It is important that the impact of what is happening to a child is clearly identified and that information is gathered, recorded and checked systematically, and discussed with the child and their parents/carers where appropriate. Assessments, service provision and decision making should regularly review the impact of the assessment process and the services provided on the child so that the best outcomes for the child can be achieved. Any services provided should be based on a clear analysis of the child's needs, and the changes that are required to improve the outcomes for the child. Children should be actively involved in all parts of the process based upon their age, developmental stage and identity. Direct work with the child and family should include observations of the interactions between the child and the parents/care givers. All assessments should be planned and coordinated by a social worker and the purpose of the assessment should be transparent, understood and agreed by all participants. There should be an agreed statement setting out the aims of the assessment process. Referrals may include siblings or a single child within a sibling group. Where the initial focus for a referral is on one child, other children in the household or family should be equally considered, and the individual circumstances of each assessed and evaluated separately. Assessment should be a dynamic process, which analyses and responds to the changing nature and level of need and/or risk faced by the child from within and outside their family. A good assessment will monitor and record the impact of any services delivered to the child and family and review the help being delivered. Whilst services may be delivered to a parent or carer, the assessment should be focused on the needs of the child and on the impact any services are having on the child. Research has demonstrated that taking a systematic approach to assessments using a conceptual model is the best way to deliver a comprehensive analysis. A good Assessment is one which investigates the three domains; set out in the Assessment Framework Triangle. Children may be vulnerable to neglect and abuse or exploitation from within their family but increasingly also from individuals they come across in their day-to-day lives. These threats can take a variety of different forms, including: sexual, physical and emotional abuse; neglect; exploitation by criminal gangs and organised crime groups; trafficking; online abuse; sexual exploitation and the influences of extremism leading to radicalisation. The interaction of these domains requires careful investigation during the Assessment. The aim is to reach a judgement about the nature and level of needs and/or risks that the child may be facing within their family and/or community. 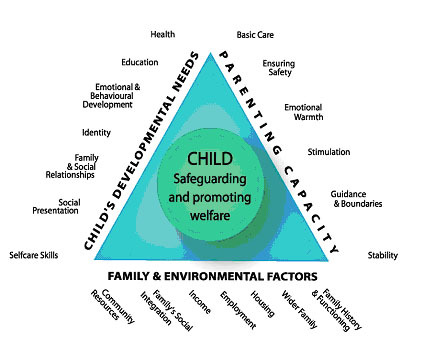 Importantly the assessment, in looking at the domains, should also consider where the strengths are in a child's circumstances and in what way they may assist in reducing the risk. Note: if there is a concern with regards to trafficking, a referral into the National Referral Mechanism should be made. See - GOV.UK, Human trafficking/modern slavery victims: referral and assessment forms. The social worker should analyse all the information gathered from the enquiry stage of the assessment to decide the nature and level of the child's needs and the level of risk, if any, they may be facing. Social workers should have access to high quality supervision from a Practice Supervisor who will help challenge their assumptions as part of this process. Critical reflection through supervision should strengthen the analysis in each assessment. An informed decision should be taken on the nature of any action required and which services should be provided. Social workers, their managers and other professionals should be mindful of the requirement to understand the level of need and risk in a family from the child's perspective and ensure action or commission services which will have maximum positive impact on the child's life. Where there is a conflict of interest, decisions should be made in the child's best interests, be rooted in child development, be age-appropriate, and be informed by evidence. When new information comes to light or circumstances change the child's needs, any previous conclusions should be updated and critically reviewed to ensure that the child is not overlooked as noted in many lessons from serious case and practice reviews. The child should participate and contribute directly to the assessment process based upon their age, understanding and identity. They should be seen alone and if this is not possible or in their best interests, the reason should be recorded. The social worker should work directly with the child in order to understand their views and wishes, including the way in which they behave both with their care givers and in other settings. The agreed local assessment framework should make a range of age appropriate tools available to professionals to assist them in this work. The parents' involvement in the assessment will be central to its success. At the outset they need to understand how they can contribute to the process and what needs to change in order to improve the outcomes for the child. The assessment process must be open and transparent with the parents. However, the process should also challenge parents' statements and behaviour where it is evidenced that there are inconsistencies, questions or obstacles to progress. All parents or care givers should be involved equally in the assessment and should be supported to participate whilst the welfare of the child must not be overshadowed by parental needs. There may be exceptions to the involvement in cases of Sexual Abuse or Domestic Violence and Abuse for example, where the plan for the assessment must consider the safety of an adult as well as that of the child. All agencies and professionals involved with the child, and the family, have a responsibility to contribute to the assessment process. This might take the form of providing information in a timely manner and direct or joint work. Differences of opinion between professionals should be resolved speedily but where this is not possible, the local arrangements for resolving professional disagreements should be implemented. (See local dispute resolution / escalation process). The maximum time frame for the assessment to conclude, such that it is possible to reach a decision on next steps, should be no longer than 45 working days from the point of Referral. If, in discussion with a child and their family and other professionals, an assessment exceeds 45 working days, the social worker and professionals involved should record the reasons for exceeding the time limit. In a High Court judgment (Nottingham City Council v LW & Ors  EWHC 11(Fam) (19 February 2016)) Keehan J set out five points of basic and fundamental good practice steps with respect to public law proceedings regarding pre-birth and newly born children and particularly where children's social care services are aware at a relatively early stage of the pregnancy. The assessment should be disclosed upon initial completion to the parents and, if instructed, to their solicitor to give them the opportunity to challenge the Care Plan and risk assessment. (See Care and Supervision Proceedings and the Public Law Outline Procedure, Pre-Birth Planning and Proceedings). A useful comment from 'Working Together to Safeguard Children' reminds all professionals of the importance of reviewing progress and that a high quality assessment is one in which evidence is built and revised throughout the process and takes account of family history and the child's experience of cumulative abuse. A social worker may arrive at a judgement early in the case but this may need to be revised as the case progresses and further information comes to light. It is a characteristic of skilled practice that social workers revisit their assumptions in the light of new evidence and take action to revise their decisions in the best interests of the individual child. Decision points and review points involving the child and family and relevant practitioners should be used to keep the assessment on track. This is to ensure that help is given in a timely and appropriate way and that the impact of this help is analysed and evaluated in terms of the improved outcomes and welfare of the child. Supervision records should reflect the reasoning for decisions and actions taken. An increasing number of cases involve families from abroad, necessitating assessments of family members in other countries. However, the Court of Appeal has pointed out that it might not be professional, permissible or lawful for a social worker to undertake an assessment in another jurisdiction. Children and Families Across Borders (CFAB) advise that enquiries should be made as to whether the assessment can be undertaken by the authorities in the overseas jurisdiction. UK social workers should not routinely travel overseas to undertake assessments in countries where they have no knowledge of legislative frameworks, cultural expectations or resources available to a child placed there. See also Working with foreign authorities: child protection cases and care orders Departmental advice for local authorities, social workers, service managers and children's services lawyers July 2014 and The International Child Abduction and Contact Unit. As well as threats to the welfare of children from within their families, children may be vulnerable to abuse or exploitation from outside their families. These extra-familial threats might arise at school and other educational establishments, from within peer groups, or more widely from within the wider community and/or online. These threats can take a variety of different forms and children can be vulnerable to multiple threats, including: exploitation by criminal gangs and organised crime groups such as county lines; trafficking, online abuse; sexual exploitation and the influences of extremism leading to radicalisation. Assessments of children in such cases should consider whether wider environmental factors are undermining effective intervention being undertaken to reduce risk with the child and family. Parents and carers have little influence over the contexts in which the abuse takes place and the young person's experiences of this extra-familial abuse can undermine parent-child relationships. In specific circumstances, through their line-manager, seek to convene a Child in Need strategy/planning meeting with relevant partner agencies (e.g. school, police, relevant voluntary bodies, etc.) to explore specific interventions to address the safeguarding issues. Within this context, children who may be alleged perpetrators should also be assessed to understand the impact of contextual issues on their safety and welfare. Assessments of children in such cases should consider the individual needs and vulnerabilities of each child. They should look at the parental capacity to support the child, including helping the parents and carers to understand any risks and support them to keep children safe and assess potential risk to the child. These interventions should focus on addressing both child and family and these wider environmental factors, which are likely to be a threat to the safety and welfare of a number of different children who may or may not be known to local authority Children's Social Care.